Have you ever wondered what causes an earthquake? Have you ever felt an earthquake? Earthquakes occur everywhere - both above ground and underground - from the San Francisco Bay area, Chile, Haiti, and Thailand to the country of Belarus. When an earthquake shakes, it's registered from a magnitude of zero to ten. 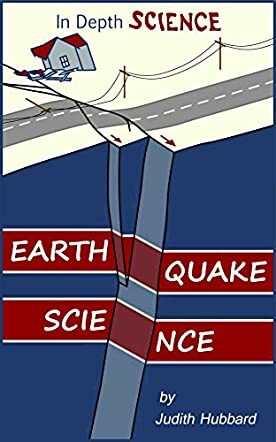 In Earthquake Science by Judith Hubbard, you will find everything that you need to know and understand about earthquakes. Earthquake Science is a power-packed educational book that is ideal for children. Judith educates children on becoming disaster ready by including a glossary and having them perform some activities and taking a quiz that includes how to develop a disaster plan and ways to create an emergency kit. Children will learn about the different occupations that are involved in earthquakes from a geologist to a seismologist. They will learn all about tsunamis and how they occur, and the importance of tectonic plates in relation to earthquake activity. I enjoyed learning all about earthquakes particularly because I'm in California. Have you heard of the San Andreas Fault? It's a part of the Loma Prieta which is located in the San Francisco area. Most of the time whenever there is an earthquake in the San Francisco Bay area, this fault is consistently affected. Why? This is because the earth’s core surrounding it is weak. In Earthquake Science, you will also see photo images from earthquake damage to how the GPS Satellite sends messages of the earth’s core to help read activity. If you look around, you will see signs of an earthquake. Look closely and you can see the shifts of the earth’s foundations from the slight unevenness of your house to the cracks in the sidewalk. Will you and your family be ready when disaster hits? To learn about the warning signs of earthquake disasters like a tsunami and be prepared, get a copy of Earthquake Science by Judith Hubbard - it can save your life.